A short and easy hike to the Koot holey lake through the country side. Bhadrakali temple is revered by the locals and is a short walk away. The temple hosts a colourful annual festival in April and for rest of years, it’s a quiet retreat. Nishani Betta in the Galibeedu Range – a short hike (2-3 hour round trip) through lush green forest with great views from the top. Abbey falls – Not to be missed, Abbey falls are about 10 kms from Three Wooded Acres by road (or if you are truly adventurous, you can even hike to the top of the falls following the stream the originates from Koot Holey). The Abbey Falls is a breathtaking waterfall where the stream cascades down a rockface from a height of about 70 feet. You can view the Falls from the hanging bridge built across the gorge. Golden Temple in Kushalnagar – The Tibetan settlement at Kushalnagar is the second largest Tibetan settlement outside Tibet. There are over 7,000 monks and students at the Tibetan monastery. The main attraction at the Golden Temple is the 40 ft tall golden Buddha statues. Mandalpatti mountain range – about 25 kms from Madikeri town, Mandlpatti is one of the most beautiful tourist spots in Coorg. Once you reach the top of the mountain the views that unfold are breathtaking. Mercara Fort – 9 kms away, is an interesting old Fort built in last quarter of 17 th century. Browsing through the old town – explore the town on foot. Check out the spices and local Coorg Honey. TalaKaveri – This is the origin of river Kaveri on the eastern slopes of Brahmagiri peak at 1350 metres altitude. Its about 50kms away and about an hour and half of beautiful drive through the mountains. Bhagamandala, 40 kms away is the confluence of two rivers, the Kaveri and the Kanika. 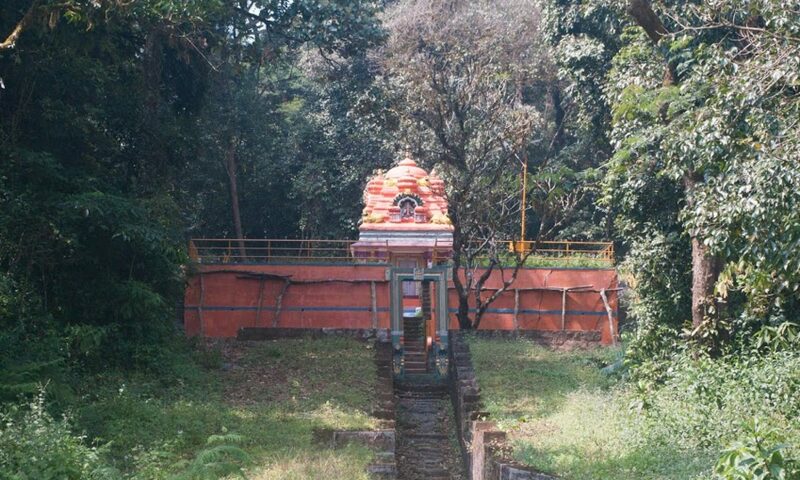 A third river, the Sujyothi is said to join from underground. There are small beautiful temples in town. You can always drop in to our property near Bhagamandala for coffee! The rooms and common areas are strictly nonsmoking. Pets are welcome provided they don’t bother other guests/staff and stay off the furniture. In order to maintain the quietness of the place, we strongly discourage any loud music.